BCA Rescue Network (BCARN) rescues only the purebred Bulldogs sometimes referred to as “English” or “British” Bulldogs. The AKC breed name is just “Bulldog”. There are other web sites and phone listings for organizations that rescue other bull-breeds. The Bulldog Club of America, working with the American Kennel Club and the other National Breed Clubs, is a part of the largest dog rescue group in the Country. BCA supports our affiliated organization, Bulldog Club of America Rescue Network (BCARN), a non-profit organization with IRS 501(c)(3) status. You can donate to BCARN by signing up for Amazon Smiles! Using Amazon Smile is just like ordering on Amazon.com, except on your first visit you will be prompted to select a charitable organization from our list of eligible organizations. Search Amazon Smiles here for Bulldog Club of America Rescue Network, INC. Amazon will remember your selection, and then for every eligible purchase you make on smile.amazon.com, the Amazon Smile Foundation will donate of 0.5% of the purchase price to BCARN. Amazon will not charge any administrative fees or take any deduction from the donation amount, and there is no cost to the charitable organization to participate. You can view the BCARN website HERE. The BCA Rescue Network is organized into local “rescue groups” of one or more individuals who are working toward these objectives. To accept Bulldogs whose owners can no longer keep them and find responsible, stable, loving new homes for them. To rehabilitate Bulldogs before placement by providing necessary medical treatment and training to increase the chances of successful placement. To help reduce the population of unwanted pets by ensuring that all rescued Bulldogs are spayed/neutered before being placed. To place Bulldogs in suitable homes as soon as reasonably possible, so they can start their “new lives” quickly. To thoroughly screen applicants before making placement decisions. To inform prospective adopters about the rescue program and the requirements for taking care of bulldogs. HOW CAN I HELP SCBR? With our busy lives and all the demands made on us, many of you may be wondering how you can help SCBR, if you can’t volunteer or give a rescued Bulldog a home? 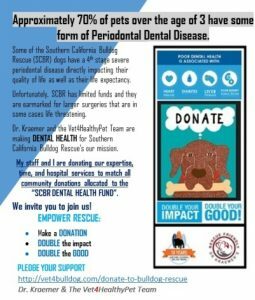 SCBR makes it easy for you to help rescued Bulldogs. When you shop at Ralphs, not only do you get everyday low prices, but Ralph’s will make a donation to SCBR! HOW? Again, IT’S EASY!! Take out your Ralph’s Rewards Card, call 1-866-221-4141, tell the Ralph’s Customer Service Representative you want to be in the Community Rewards Program and you pick Southern California Bulldog Rescue as your organization! Now, each time you shop at Ralph’s, use your Rewards Card, and Ralph’s will make a donation to SCBR! Don’t have a Ralph’s Rewards Card? EASY! Just call 1-866-221-4141 and tell the Ralph’s Customer Service Representative you want a Ralph’s Rewards Card! Then, tell the Ralph’s Customer Service Representative you want to be in the Community Rewards Program and you pick Southern California Bulldog Rescue as your organization! Dr. Kraemer, Vet 4 Healthy Pet, has graciously provided kennels and an exercise yard for SCBR! The kennels are bright & airy and the exercise yard is grassy with huge shade trees. Both are lovely areas for rescued Bulldogs to recover and recuperate from the trauma of being surrendered or abandoned. PCBC would like to thank Dr. Kraemer for his kindness and caring of the rescued Bulldogs of SCBR.